Providing you the best range of hydraulic plate machine, double cylinder paper plate making machine, semi automatic hydraulic paper plate machine and automatic paper plate making machine with effective & timely delivery. Number Of Dies 4" - 15"
Owing to the expertise of our team of experienced professionals, we are able to introduce an exclusive range of Automatic Paper Plate Making Machine. 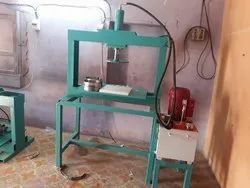 This machine can produce 2700 to 3000 pcs per hour using 220v 50 Hz power source. It has 2 hp (single or three phases) motor. 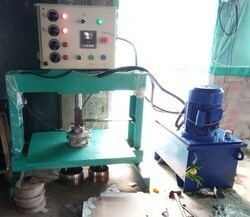 The offered machine is fitted with electronic panel and sensors. Moreover, the provided machine requires less installation space and offer low power consumption. Model no gte-t1die size 4 to 15 inch. Paper material 80 gsm to 500 gsm. Production rate 1200 to 1500 pieces per hour. Power source 220v, 50 hz. Electric motor 2 hp, single phase. Electricity consumption 1. 5 unit/hours. The weight of machine 200 kg approx. Oil tank capacity 40 ltr.